This homemade knock-off ice cream recipe is a delicious & affordable treat that you can make at home, to enjoy this summer. One of my very favorite things to make during the summer is delicious homemade ice cream. My kids love when I take them out for a nice cold treat when it’s hot out, but I thought, how much better to get them involved in the process in making their own delicious treat? Which clearly, needs the outer cover to be replace, because I’ve used this thing quite a bit (since 2002). So, it’s seen a few days of homemade ice cream recipes & then some. I found this particular brand of ice cream at the local Publix supermarket & loved it! It had a subtle coconut flavor and itty-bits of fresh coconut texture. Since I had most of the ingredients on hand. I decided to go for it. The only thing that I needed to make this recipe happen was heavy whipping cream. In a large mixing bowl, combine, heavy cream, coconut flakes and sugar until fully blended. In a separate bowl blend plain yogurt and milk until smooth. Combine milk & yogurt mixture to coconut and cream mixture and fully blend. Once, you’ve got that done, begin setting up your ice cream maker. *Note: After each time we use our ice cream maker, I wash out the inner basket, dry it completely and place in a plastic bag, back in the freezer. The purpose of placing in the plastic bag is so that nothing gets inside of it. And the purpose of keeping it in the freezer even when you have no upcoming plans of using it, is so that when you are ready to whip up a batch of ice cream, you’re good to go, without waiting a day or two for the basket to freeze. After your ice cream machine is all set up, another little trick that I’ve learned is to pour the cream mixture in without the final lid being on. So, pour the mixture in before you place the lid on it. I have always put the final lid on like a cap and then have had to come back to clean mix off of the edges and sides of it. Now, I realize that I could have skipped that clean up step all-together. Since your basket is already frozen, this should take no more than 20-30 minutes. If your basket is not frozen solid and just cold, your ice cream may never fully form. Even putting that liquid into the freezer as is, will not turn it into full-on, ice cream. Because we added plain yogurt to this, the texture is extra creamy and the little bits of the Trader Joe’s coconut flakes makes the texture of this, just that much more awesome! I may or may not have been taking little samples from this batch before my ice cream was even done. The bonus for me was that I kept the container from the previous “store” batch for this, and reused it once my ice cream was through. Will you try this? I hope that you try this. In a large mixing bowl, combine heavy whipping cream, granulated sugar, and coconut flakes until completely blended. In a separate and smaller bowl, combine plain yogurt and milk until smooth. Add yogurt mixture to coconut cream mixture and completely combine. Set up ice cream machine, complete with completely frozen freezer basket. Before attaching the cover/lid, pour cream mixture into the basket, and then set cover/lid in place on top. Hit the “on” button to churn mixture for 20-30 minutes or until completely thick and creamy. After 30 minutes, ice cream should be set. Use a large metal spoon or wooden spatula to serve ice cream immediately or store in an airtight container in your freezer until you’re ready to eat. The girls and I had a wonderful day, whipping up some recipes at Williams Sonoma from the American Girl Doll, Garden-to-Table Cookbook. They were preparing two recipes: one was a mixed berry cobbler and the other we’re vegetarian roll-ups. They had a lot of fun taking turns, using the different equipment, slicing and prepping the fresh produce. I love seeing them in action making their own creations & to see their pride in their accomplishments. This cookbook is also one that balances basic cooking skills as well as hands on recipes that the girls will enjoy creating time & time again. I found myself gazing the equally beautiful tablescapes laid out through out the store. I love that this one incorporates the newly popular (faux) succulents as accents for the decor. I’m so glad that we got to try out some new & fun recipes and that we had a little Mommy & me time today! I loved this idea that I found on how to make your very own frozen corn treats for your feathered-kind. I know all too well, that our chickens can easily overheat or dehydrate if not careful during the summer months in the South. So this idea, was just perfect for us & simple too! (1) With a large tablespoon, equally divide the corn into each of the cavities in the muffin pan. (2) Double back with the liquid and evenly divide it among corn. (3) Freeze for 3 hours or until frozen solid. (4) Allow 5-10 minutes to thaw before trying to serve the chickens. This allows the edge of the ice to melt just enough for you to fit a butter knife in an lift the frozen corn cupcakes out. *Notes: This can also be done with an ice tray or with a silicon muffin pan to make for easy removal. I hope that your chickens will enjoy. I know that mine will come the 90+ degree weather that is in the forecast for today. I whipped up some of these fun Mother’s Day popsicle flower pots for some of the special “mothers” in our lives. The supply list is rather simple, and it can take all of 10 minutes to complete, from start-to-finish. You will start by painting the front and back of each of the popsicle sticks. While you are waiting on these to dry, cut out three 3 inch flowers, and 3 yellow circles and assemble together with your glue stick. Then once the popsicle sticks are dry, hot glue the ends together forming a box. After you have your box in place, hot glue one of each of the four magnets to the corners of the frame. (I did all of this before adding my picture). Next, add your picture. I used a 5 x 7 printout of a color copy of my photo on copy paper and actually had to cut it down to size. The inside of this box is bigger than a 4 x 6, but smaller then a 5 x 7. So I took just a portion of the background out from the 2/3’s line (in width) of the picture to make it fit and then secured it with clear packer’s tape to the sides of the popsicle frame. Once you have your photo in place then hot glue the cardstock flowers to the pipe cleaner stems and then add them to the back of the photo. After that step is complete, you are done! Here you have these adorable popsicle fridge magnet flower pots that mom, grandma, neighbor, friend can look at year round. Popsicle magnet flower pots also make a great homemade gift idea for friends, family, neighbors, teachers, and more! Whip up a few in about 10 minutes for a thoughtful handmade present! It’s Teacher Appreciation Week and it’s that time again to put your time & creativity to let all of the teacher’s in our lives know that we care. Below, I have rounded up nine of my all time favorite teacher appreciation gifts. Some require a small purchase, a printable & time. How special will your child’s teacher(s) feel when they receive this gift. Best of all to know that you care and took the time to let them know that they are in fact making a difference. I will also put this one on my list for a great “back-to-school” gift. Mother’s Day is literally right around the corner. I have become so intentional about having a game plan together before the day (or the day before) arrives. 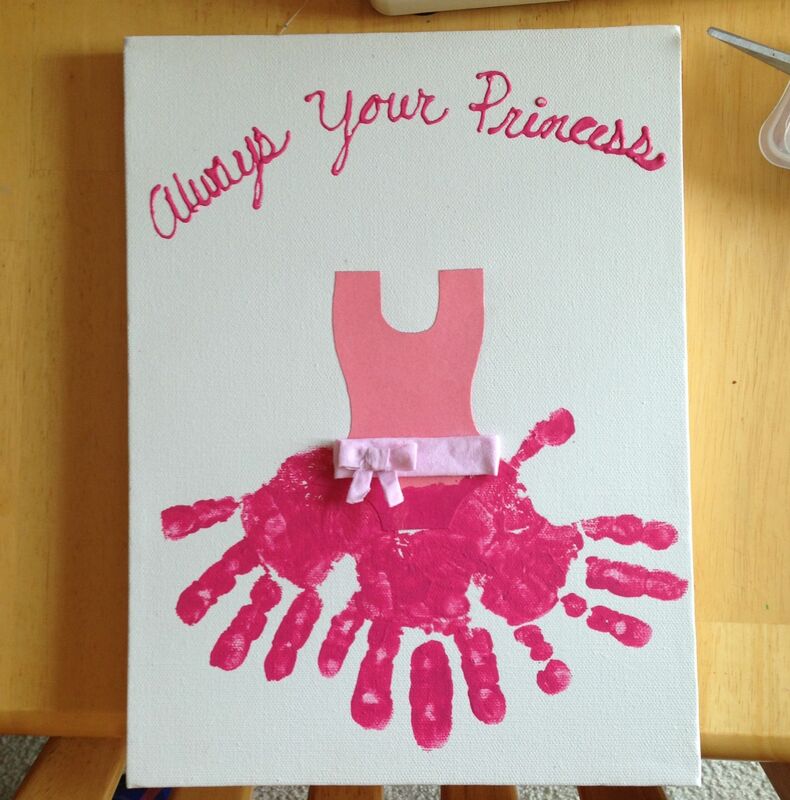 I have put together this list of easy, thoughtful, creative and equally heart-warming hand-made gifts that you can make for mom or grandma this Mother’s Day. All of these ideas are fun, creative & most of all, easy-peasy. So what are you making for Mom this Mother’s Day? I made this version of a giant Samoa cookie for our Girl Scout End Year Celebration last year & have made it again, this year. Now, I want to share it with you! Combine the flour and salt in a bowl. In a separate bowl, beat the butter with an electric mixer until pale and fluffy. Add the sugar and beat until combined. Add the vanilla. Add the flour mixture and mix until just combined. Shape the dough into a ball and wrap in plastic wrap. Refrigerate until firm, about 1 hour. Watch the video here to get a visual of this technique. Roll the dough out on a floured surface to 1/4 inch-thick. Use a bowl or plate to cut it into a large circle (make sure it will fit on your baking sheet!). Transfer the circle to a sheet of parchment paper, then place on a baking sheet. Slice a smaller circle out of the center to create a ring. Prick the surface with a fork, then bake at 325F for 20 minutes, or until the edges are just starting to brown. Cool completely on the baking sheet. Evenly sprinkle the shredded coconut onto a baking sheet lined with parchment paper. Bake at 350F for 10 minutes, until the coconut is toasted. Set aside. Spread about half of the melted chocolate onto the underside of the shortbread cookie, completely covering the base. Transfer the cookie to the freezer or fridge for the chocolate to set, while you make the topping. Place the soft caramels, milk and salt in a pot and set to medium heat. Stir constantly until the caramel has completely melted. Pour the caramel into a bowl with the toasted coconut, reserving about 1/3 cup of caramel. Mix the coconut and caramel mixture together. Spread the remaining caramel onto the non-chocolate side of the shortbread cookie. Generously spoon the coconut caramel mixture on top. Drizzle the remaining melted chocolate on top of the coconut. Enjoy! So that’s it! These are all pics from my very own creations. All of the pictures in this post were from this year & last. I hope that you enjoy & that you make it for your next Girl Scout celebration! I’m so excited about my VERY FIRST set of FREE Spring Happy Planner Stickers! I have long been a fan of the Michael’s brand Happy Planners & now I (and you do too) get to decorate them for the seasons with my new free printable stickers. If you’re not familiar with the Happy Planner, you can find them at Michael’s, sometimes Walmart, at Joann’s and of course on Amazon.com. I prefer to get mine from Michael’s and actually did get the one that I have from there because I like using my coupons. I designed these printables with spring in mind: pale pinks, greys and some green, sure to brighten any day. I also wanted to use some inspirational quotes like, “Seize the Day” and “Now faith”; things to remind you to remember you, “Why” and to help, give you that push and sense of meaning to get you through the day or week. I have used these in my actual planner. So I wanted to make sure and pick and theme with colors that I actually loved. To adorn your planner with these happy stickers, just click on the files below, and save them to your pc or flashdrive. You can either print on to regular paper and use a double-sided adhesive tape or a light glue, OR you have it printed directly on to full label sticker paper and then cut each sticker to size as needed. I hope that you enjoy these fun printable stickers as much as I do. I love making homemade cookies. Each year, usually around Christmas, Thanksgiving or holidays (or anytime), I break out a batch of cookies & every now and again, I hit on a favorite. THIS particular cookie has been a real favorite of the ones that I’ve made for my own family & relatives alike. I call it my Sweet Cream Cookie because although the originally recipe says that it’s “Stawberries & Cream”, I have used so many different varieties of fruit fillings to fill the center with. I’ve done these cookies with guava, blackberry, strawberry, apricot, blueberry, and lime. They’re absolutely delicious with whatever fruit flavored filling, you fill them with. It was one of those $9.99 magazines that you see at the checkout counter that actually looks different from the rest, and I don’t mean in just the content. It’s the quality of the cover & the quality of the image of the recipe. And if you’re used to cooking & baking, then you can sometimes just look at the cover image that’s on the magazine & know that the recipes that are inside are going to be GREAT. Then, you’ll usually look down to check the price of said cover and it’s, oh, $9.99 or $10.99….and in this case, totally worth it! I have been making cookie recipes out of this magazine for almost ten years (since 2009)! And, I love them every time. There are old favorites that are tried and true to my repertoire and this is one of them. You start this cookie, just like you would any rich & buttery cookie, with butter and cream cheese. And then it all goes uphill from there! which is strawberry, and then I added the apricot jelly to it, and last but not least, I got lucky at the new LIDL’s by us and found this nice blueberry jelly. You don’t often see blueberry jellies or jams sold in stores. I don’t ever have a problem finding strawberry, blackberry, grape or apricot, but when I can find something like peach or blueberry, I grab it! I grabbed my cookie containers for $1/each from the Dollar Tree (and that includes the top and the bottom of the container), and I made one to send to a friend & one to my dad.